Wedding guest attire guidelines can be tricky, but we’ll decode the dress codes for what to wear to a casual wedding, a beach wedding, a semi-formal wedding, and the most formal events. When your next wedding invitation arrives, guests typically get all the details of who, when, and where – but the specifics of the other “w”s–namely, what to wear to a wedding are sometimes left for guests to interpret between the lines. In general, daytime weddings are more casual, and so lighter fabrics, festive colors, and less-formal attire is the rule. For women, a nice daytime dress, skirt and top, or jumpsuit are good choices. For men, a well-tailored suit in a mid-to-dark neutral color like gray, blue, or charcoal is appropriate. In the case of evening weddings, more formal styles, longer dresses and gowns special occasion fabrics are appropriate. Men should wear darker suits in navy. black, gray. (Although sometimes a white dinner jacket or tuxedo in a fun color, can work too! We’ll go into more detail!) The wearer should also always chose something that fits with one’s own personal style! The standard rules of being well-dressed for a wedding still apply. Please don’t wear white or off white dresses And of course, don’t wear anything too short or revealing, don’t look unkempt or wrinkled. But even after those general wedding guest attire guidelines, there can still be many gray areas. We’ll go in to much more detail about wedding dress codes below! Why Follow the Wedding Dress Code? It is a sign of respect for the couple and the event to get dressed up for a wedding, and your attire should always be respectful, conservative, and appropriate. But keep in mind, the rules of etiquette were designed to help one feel more at ease and comfortable in all social situations. So simply remember your cheerful presence at the wedding is what counts here, and you’re likely to have a good time no matter what you decide to wear. Affiliate links are used in the shop sections of this post. 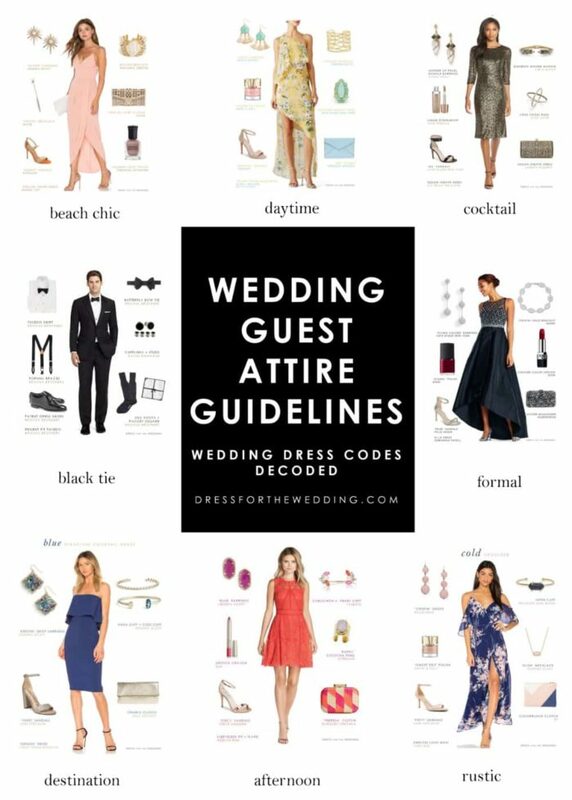 Quickly find attire for your next wedding by dress code, or read below for the guidelines of what to wear! What is Casual Wedding Attire? While this type of dressing sounds the most relaxed, it can also be the most open-ended, and, therefore, sometimes the most mystifying! The venue may help you better determine the best level of formality –or lack thereof. Usually this casual style is reserved for a morning or daytime wedding in an outdoor or informal venue. For Women: A skirt and top or nice pants with a pretty top, and a casual sundress or casual cocktail would certainly be appropriate. For Men: If it’s a very casual event, just a nice collared or button down shirt in a short or long sleeve, worn with a tie, and some dress pants might suffice. However, unless it’s a casual outdoor wedding or a beach wedding, usually little more formality is good. If you’re sure it’s casual enough that a full suit isn’t required, try a navy or subtly patterned blazer and dress pants with a crisp collared shirt with no tie, or if you forgo that tie, vest, and shirt can work. After all, it’s a wedding, and still calls for a little more formality. So err on the side of being overdressed; it’s easy enough to take off the tie or blazer if you feel like you’ve gone overboard. For the Feet: Heeled or structured sandals (not flip-flops) for footwear for women are fine, and dress shoe like a loafer or similar style would be nice for men. Sneakers or sneaker-like shoes should be avoided. What not to wear: jeans, tank tops, t-shirts, stretchy pants, cargo shorts, flip-flops and athletic clothing would still be a poor choice, unless specifically approved. This style of wedding sounds soothing and peaceful at first, but can be very intimidating to dress for. Again, let the venue, weather, season and time of day be your guide. Are you headed to the local State Beach at sunset for an informal exchange of vows, or are you going to be at a four-star hotel’s private beach club, with elegant cabanas and white-gloved waiters surrounding you? If it’s the former, wearing approximately the same thing as a casual wedding – but with a beachy twist and beach appropriate fabrics should be fine. Women can also wear a beachy look with a linen or cotton shirt and nice pants, or a pretty, light, flowy skirt, tunic dress, or casual sundress. Men can wear a festive linen shirt, a cotton short-sleeved shirt or button down, or a tasteful tropical printed shirt. I’d pair this with dress pants in linen, cotton, or twill, or – if you have the knees, socks, and courage for it– Bermuda shorts. If it’s the more formal venue, women can wear a sundress, a casual maxi dress, or beachy-but-elegant skirt and top, and make the look a little bit dressier with some dazzling accessories. At a more formal beach affair, men’s shirts should be of an elegant linen, or crisp cotton. A summer suit or sport coat in a madras or seersucker or linen would fit well here. A tie is not required, but some of the lovely preppy or beachy print ties would certainly look wonderful, just be sure to wear them with a shirt with a full length sleeve. Because of the sand, you’ll want to wear flat shoes with some grip in case there’s a slippery rock step or two for you to navigate. Or, be prepared to swap out your heels for some flip flops, and then change back if you find yourself on solid ground again. This designation is a bit of a contradiction but if you combine elements that are little bit dressy with casual you should be just fine. What is a Semi-Formal Wedding Dress Code? A semi-formal dress is an evening style of dress with formal fabrics like a satin, chiffon, silk, and a bit of beading. A rich fabric like velvet or velveteen in the winter months would also be very nice. Generally, the dress length would be cocktail length—in other words, just above, or at the knee; or a little longer. A tea length, midi length, or a longer, ankle-skimming hemline–like a maxi dress would also be perfect, as long as it is not an overly formal silhouette or material–save those ball gown style dresses for the fully formal wedding invites you receive! Black tie optional dress code, is formal but with the option of black tie. I would assume that the wedding party will be wearing tuxedos and formal attire, but the guests need not exactly meet that level of formality. For the women, a dressy cocktail dress, jumpsuit or sleek pantsuit, or a long formal dress or long skirt and top is appropriate for black tie optional attire. You can see more details below in Black Tie required. For male guests, if you or your date is like James Bond, George Clooney, or some other an elegant man who owns his own tuxedo by all means wear black tie. However, there will be probably many other men in a dark suit and dark tie or bow tie and these gentlemen will look just as elegant and appropriate as the dapper tuxedo-wearing folks. Find a Black Tie Optional look or Find a black tie optional wedding guest dress. Women should wear an elegant cocktail dress or full length dress, and beautiful real jewelry or costume jewelry. Sparkling accessories are encouraged for formal events! This one clears up any ambiguity for the men. In this case, a tuxedo in a dark color is in order with the other elements: either vest, or cummerbund, or suspenders, and appropriate bow tie or tie. In some cases, a well-cut black suit and black tie will do! Women should generally wear a full length gown for black tie dress codes, but those rules are changing. Many styles of types of mid-length, cocktail, or tiered skirt length are usually be appropriate if the material, cut, or embellishment is highly formal. A long or ball gown style skirt paired with a dressy top, is also a great look. If dresses aren’t your thing, a formal pantsuit or women’s style tuxedo or formal jumpsuit is also appropriate, especially if a skirt or gown isn’t part of your personal style. This is the most formal type of wedding, so you should adhere to the rules on this one. I had to consult Emily Post again on this, since these types of weddings are rare in my life. If the wedding party will be wearing some sort of cultural dress that is not your own culture–for instance, kilts or saris you could wear something that might blend to that, as long as you are sure you are not appropriating cultural dress. For instance, if you know the groomsmen will be wearing kilts, perhaps wearing a tie with a bit of plaid is a way to join in, without upstaging the attire of wedding party. If you were attending an Indian wedding, but not specifically asked to wear a sari, perhaps wearing some Indian-inspired jewelry or a rich-jewel tone dress would be a nice way to be festive, again without detracting from the bridesmaids’ rich attire, or mis-appropriating cultural dress. If your own religion or heritage states that you wear a certain type of dress to an occasion, as long as you’re sure it’s in keeping with the event and won’t cause offense or detract from the event, then I’m sure most couples would welcome this expression of respect and festivity. I’m eager to hear first-hand stories on cultural dress, so if anyone has experience here, please let me know. If the invitation is vague, and there’s no wedding website, getting more information on what to wear can also be gleaned from the wedding party. They are likely know the attire in advance. I would avoid asking couple getting married about the dress code unless you are already in frequent communication. Please especially don’t ask the couple for details within a few days of the wedding. The couple have so much going on already! One of the roles of the wedding party is to support and attend to other details –like assisting guests with questions like this! If you know a member of the wedding party, ask them about the dress code. Attending the showers, bachelorette parties, are good avenues for getting in touch with the bridal party. Asking someone in the wedding party about what to wear, also help to ensure you pick a dress that is complimentary to the wedding theme. It will also help you avoid wearing a dress that is similar to the wedding party. It’s an easy mistake to make, since many guests and bridesmaids shopping at similar stores. If you don’t know the couple — perhaps you are a date of a friend — then you might call the venue or check their Instagram of other weddings to see what type of dress is appropriate. Sticking with a classic semi-formal look is usually a good rule! Another idea is to bring a few easily-packed accessories that will either dress up or dress down your core outfit. Then, just adjust once you find out how everyone else is dressed. Again, no matter how you are dressed, be sure to enjoy yourself! Editor’s credits: The foundations of this article were written a bit from what has been ingrained in me, along with my own gleanings from weddings I’ve attended, with a few checks at EmilyPost.com and Martha Stewart Weddings.com , to make sure my information is mostly in alignment with their always-wise advice.